The backdrop looks fantastic. Interesting. How high is it? Was it difficult to put up? Were you able to put it up by yourself or did you need help. I would imagine its like doing wallpaper, not too hard but easy to mess up. Hope your hand surgery heals quickly. I installed the backdrop by myself, and since I only have one and a half hands at the moment it was not what I would call easy, but it was not hard. the big section was 8' long and 40" high. to fit the print I took some scrap paper I had from an old roll of printer paper. The prints come wrapped in some large sheets of paper that I also used. I taped up the paper over my backdrop in an area that was 8' x 40". 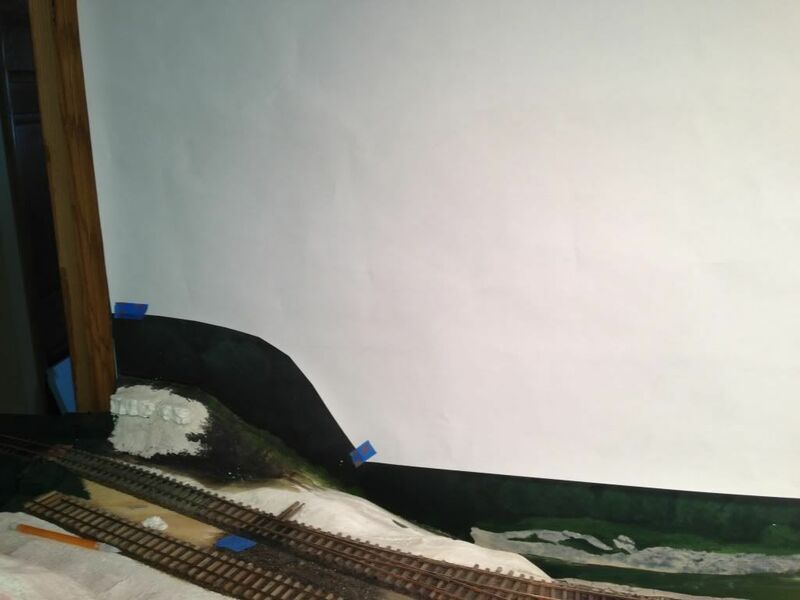 I cut away the paper around my existing scenery so the paper laid flat on the existing backdrop. I used scraps of paper and tape to tape in small pieces of paper to meet the existing scenery. I removed my full size template from the backdrop and laid it over my photo backdrop print, then I used a marker to trace the areas to cut out. I had a metallic gold permanent marker that showed up well on the print. 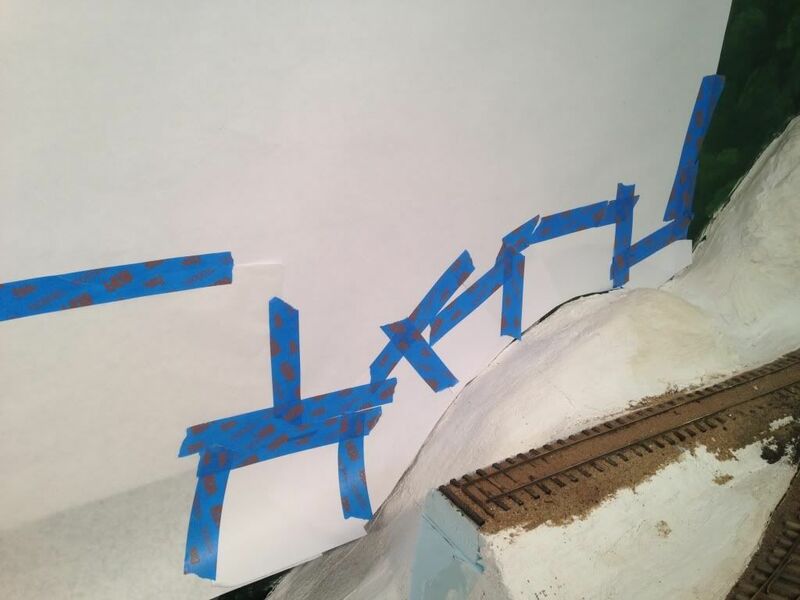 I checked the fit of the backdrop, using blue masking tape to hold it in place. I found the print stiff enough that only two pieces of tape, one on each end, were enough to hold it in place. I did a test with the masking tape on a piece that got cut away to make sure it would not damage the print, I cant say if regular tape will have the same results but the blue masking tape worked fine. 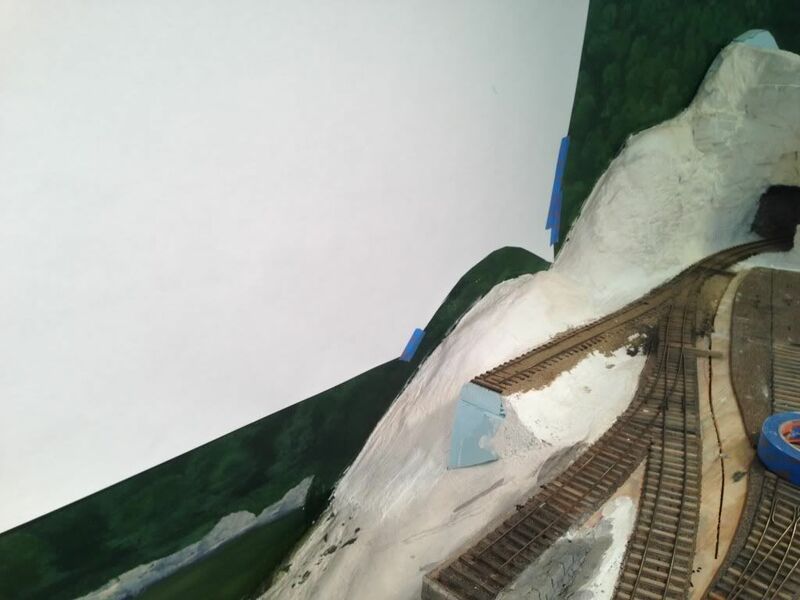 the print came with a very nice sky on the top edge that I had planned to use but the deepest part of my gorge at the dump trestle was 47", the limitation of the printing processes only allows prints up to 40" tall. originally I thought I would just raise the bottom of the gorge up but after some thought I felt that lowering the photo print was better to keep the feeling of a deep gorge, so I decided to cut off the nice sky. I slid a cutting mat under the top edge and slowly cut away the sky with an x-acto knife. 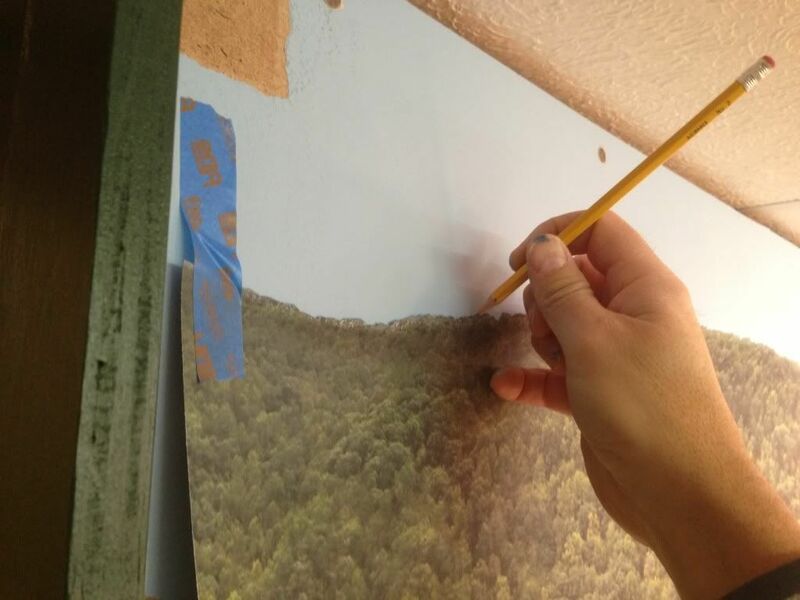 To hide the fresh cut edge at the top of the trees I mixed up some blue acrylic paint that matched the printed sky. I dipped a makeup sponge in the paint and just dabbed the edge of the print. I did not use green because the top edge of the print has a nice transparent tree line, if I used green it would not blend as nice as it does. The print is a nice stiff paper, almost vinyl feeling, it cuts nice and clean and it tough on the surface. I decided that I would lower the print 4", so I used my template again and placed it on the print 4" higher on the bottom and cut more of the bottom ends away. without a top edge to keep the print level I placed some masking tape pieces 44" down from the top edge of my backdrop. placed the backdrop back up, lined up the bottom on the tape markers and re-taped it in place. then I drew a light pencil line along the top edge, keeping the pencil angled down so the line was just a little below the top of the print and not visible, this will let me know how high to apply the spray glue so it would not get on the exposed painted surface of the sky. 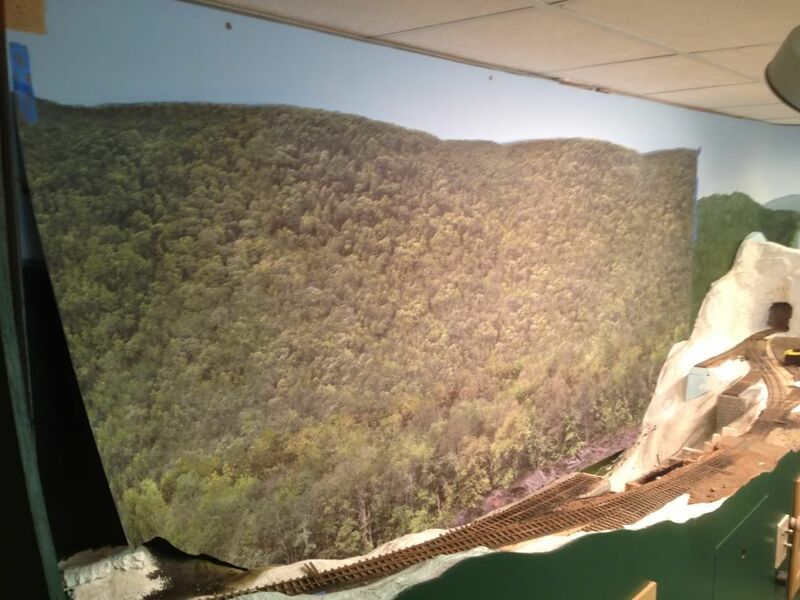 I places a piece of tape on the top of the backdrop about 16" from the left and rolled the backdrop up to that tape mark and temporarily taped it in place so it would not unroll. with the print rolled back I covered the layout surface with newspaper to keep spray glue overspray from getting on everything. I held a piece of cardboard in my left hand and used it to block over spray as I applied 3M Super 77 glue along the pencil line and the left edge of the backdrop. I unrolled the print and from the back of the print I sprayed a fast light pass just along the top edge of the print. Here is where it would have helped to either have two good hands, or better yet a helper. My print moved up just a bit as I unrolled it, once the print touched the Super 77 it was in place and I could not adjust it, so the print is about a half inch higher than I wanted it, not a big deal and I can blend up the scenery a bit. 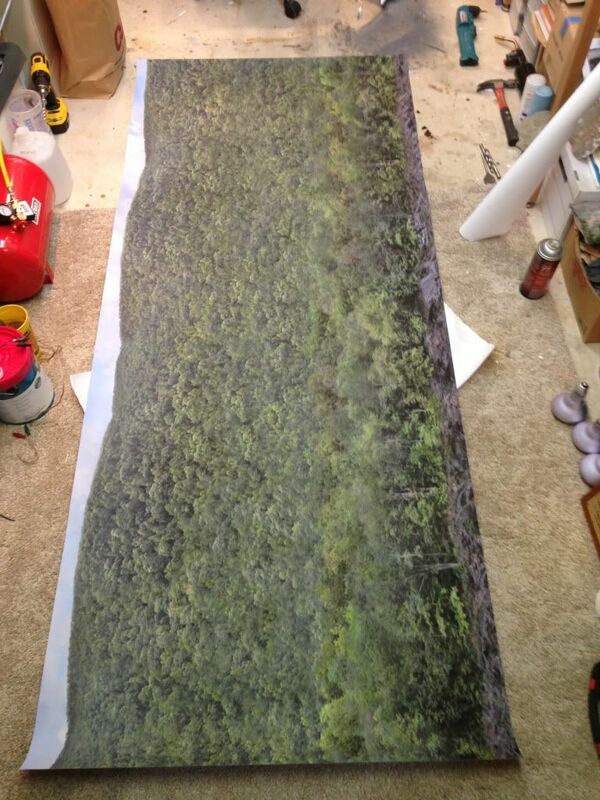 if I were to do it again with a print this big I would get a helper to make sure the print does not touch the glue until it is all lined up. I used my hand to work from the center of the print out to the edges, there was an air bubble but I was able to push it out and got the print all nice and flat. With the left side attached to the backdrop I rolled up the right side and repeated the same glue process and attached the right side. the mating print on the right edge is only 27" tall and I think it will be much easier to install. As I work around the layout my prints will be less than 24". I will post progress as I go. That sounds like quite a process, but it sure looks great all in place! Very well done Jeff. Seeing how you cut the prints to conform to your hills, we actually could have left the terrain outlines on the print that I had on one of the samples that I showed you. You know the ones with the black on the bottom. 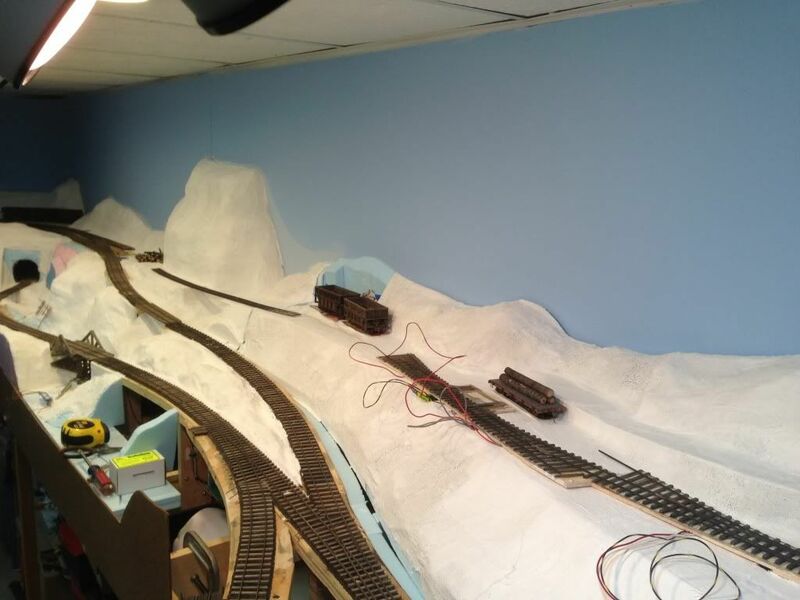 You are more than welcome to show the folks the previews I posted for you on the "client" page link that I showed you (it's still up there)and it would give them an idea of the terrain mating. Fantastic to see it come together! Thanks Joey, I will get that link and post it. I am glad you did not leave those area black because those were approximate and I wanted to get them exact with the templates, it is too bad it slipped a little because I had it cut exactly right. Here is the link that Joey sent me to review my order before he committed it to print. Looks great with the new backdrop! Hope the hand heals quickly. Same as Ray on your hand,.. I am sure the new backdrop has fired up your creative juices big time. I look forward to more progress on Slater Creek. 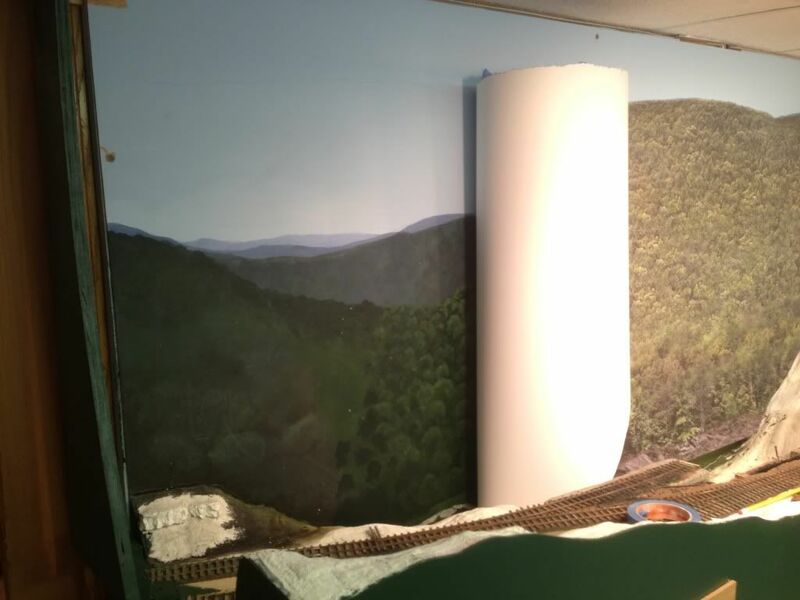 The photo backdrop is driving me to finish the scenery around it. I still have one more section to put up but I wanted get the rocks stained first. 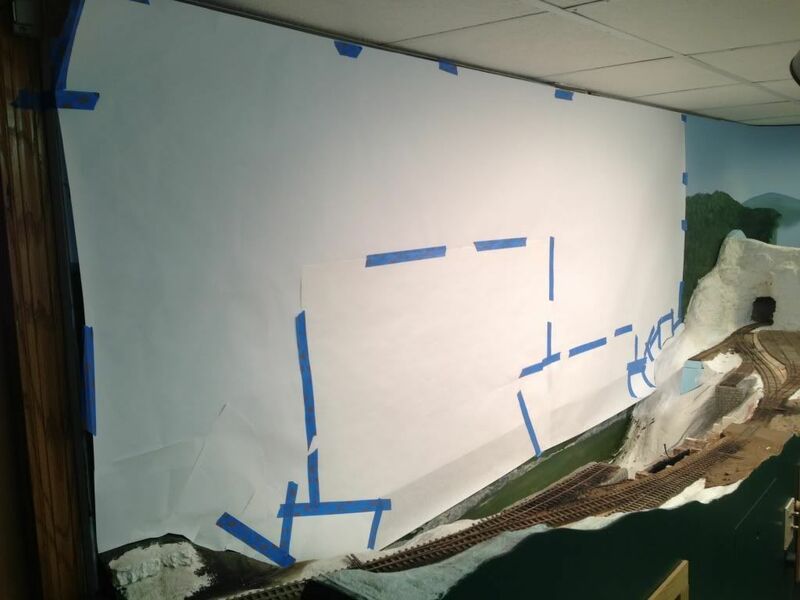 I tapes up a piece of the backdrop i trimmed off as a color guide. the color of the rocks on the backdrop are really distict and i wanted to capture the same look. I started with diluted acrylic paint but something strange happened. I used plaster of Paris to cast the rocks, I cast them wet in place and blended the castings by hand carving between the casting. The strange thing that happened was the stain soaked into the areas I carved and didn't in the areas I did not carve. Basically it looked like I outlined my castings, it look horrible. To fix the problem I mixed up some black, raw umber, and white to make a really dark gray / brown color that was not transparent, and I painted everything with it. After I let the basecoat dry I dry brushed on lighter shades to match he photo. I like how different the rocks look, not your typical brown colors of burnt umber. I even added some light green here and there like in the photo. Great work Jeff, this is really coming out nice and I am so excited to see it all come together. more progress to show. I finished a little more scenery shell so I can get a final idea of what I will need to have Joey make the rest of my backdrop image. 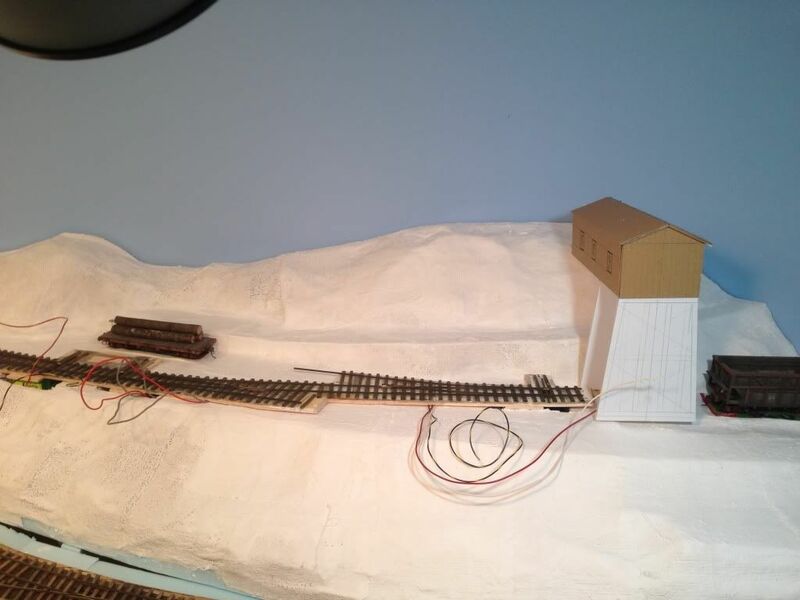 After this I have to focus on the dump trestle area for an article I am going to start writing. 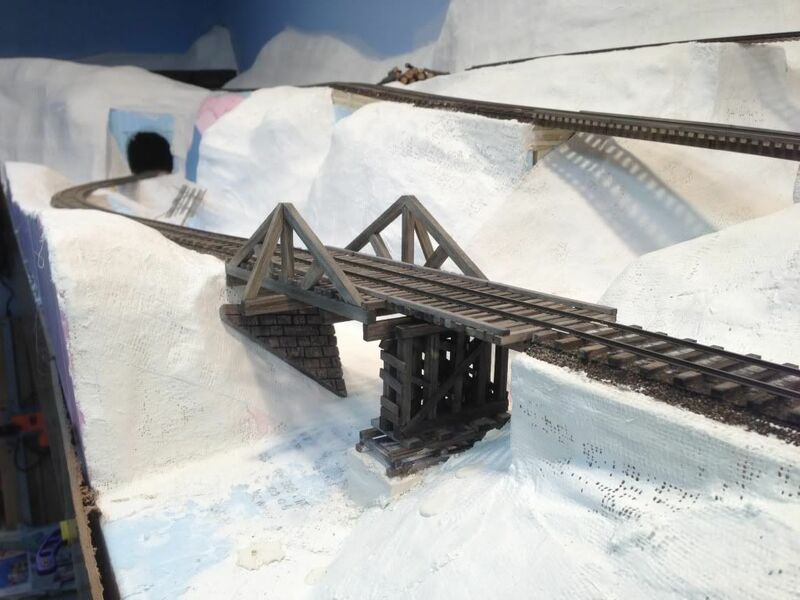 My goal is to get all the scenery around the dump trestle finished and get the final fragile details added so I can get a good photo of it. I did a mock up of the tipple I am going to build at this site. 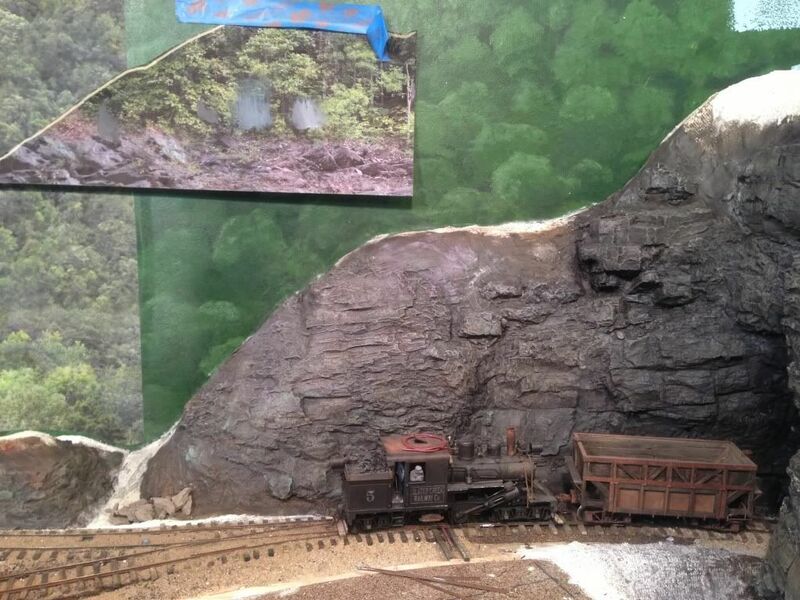 The model is based off of a tipple in the "King Coal" book. I am debating if I should try and make this tipple live load coal, part of me thinks I should because I am using live loads and my hoppers really dump the coal, but on the other hand I know that in real life railroads back then did not use a locomotive to load the hopper cars. Most loading of empty hoppers was done by rolling the hopper cars by gravity, a car puller, or even man power. Normal operation would be to spot the empty hoppers at the tipple, pick the loaded hoppers and leave, then over the course of the day / night the empty hoppers would be spotted by the tipple operators and loaded. Therefore my model operations would be to hand load empty hoppers before an operating session. 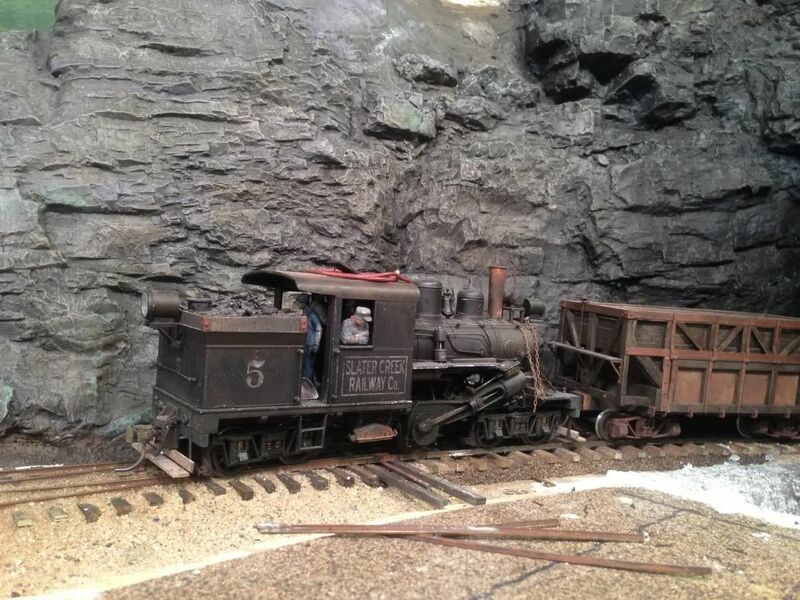 At the new tipple location there will be two mine openings, an older small opening that only loads a car or two using a simple dock over the loading track, here mine carts will be dumped directly into waiting hoppers, a very slow process. The second mine will be a much larger more established operation which has a tipple with a small sloped bottom bin under it to allow for the dumping of mine carts when hopper cars are not present. The larger tipple also has a short spur for the unloading of mine supplies, such as mine timbers. 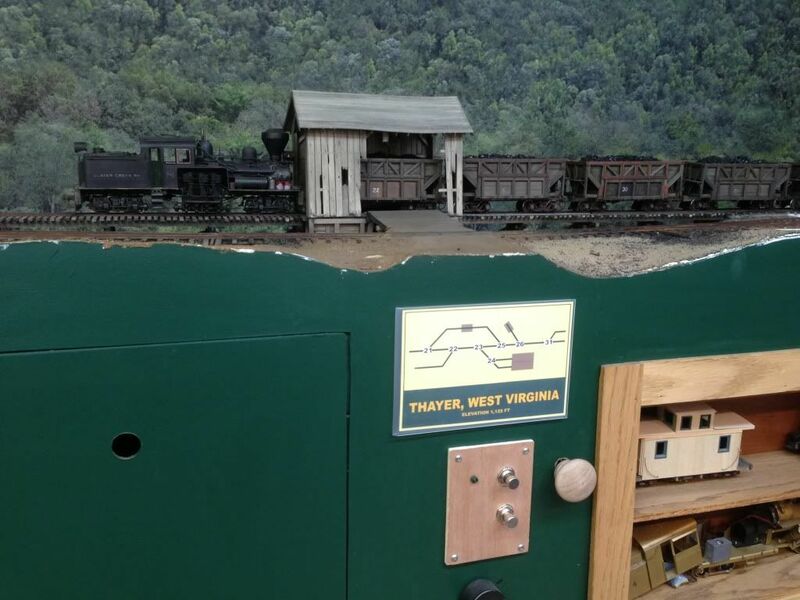 There is a electric mine haul track that runs from the supply spur up under the tipple to the mine to allow mine carts to load the timbers and haul them to the mine. I also built this small A-frame trestle over Slater Creek. 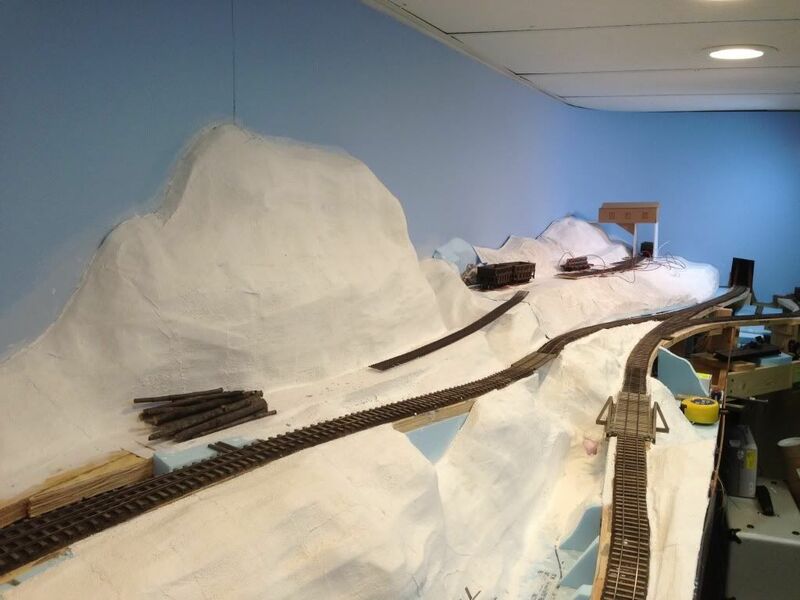 It is not finished yet, just enough to get the mainline running again. I still have to add the metal parts and rods. 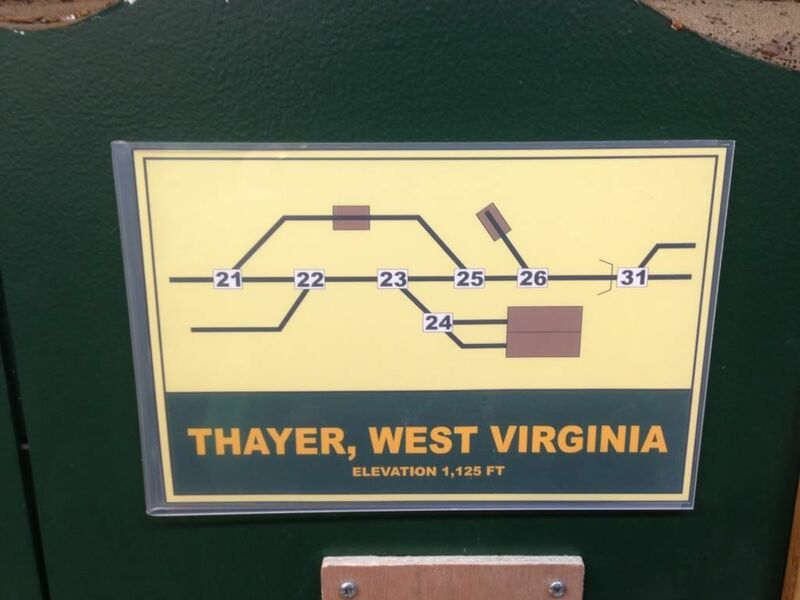 Another project I started was to create little track diagrams at the switching locations. I am using "The Hare" switch decoders on all my turnouts and I use the DT-400 throttle to call up the turnout number and throw the switch. To keep track of the switch number I wrote the number of the turnout next to them on the benchwork, however since I have done scenery the numbers got covered up. The solution was to buy some 4x6 plastic magnetic photo holders from Michael's. I drew up some diagrams on the computer, printing them on some photo paper and used some double stick foam tape to mount them on the layout fascia. The progress looks great. I really like the tipple scene. Can't wait to see what your scenery will look like. I think a locomotive to load cars is not unreasonable for this operation. Its a terminal line. Looking at the timetable of trains in the book, it sure seems that they could have used a loco to load the cars. I agree however, that there is clearly a car moving winch at the one tipple.